Runners compete in the Durkle Track & Field meat at Twin Valley South. Twin Valley South hosted the Durkle Invitational on Friday and was well attended by fans, Athletic Director Tony Augspurger stated; “if it wasn’t a record breaking crowd, then it was close to it.” Eaton won the girls side with 105.5 points. Host Twin Valley South won the boys side with a score of 91.5 points. Local teams finished as follows: Girls – fifth place (tie) Ansonia, Arcanum; eighth Franklin Monroe; 11th Tri-Village. Boys – sixth place Ansonia; seventh Arcanum; ninth Tri-Village and Franklin Monroe 16th place. There were some outstanding individual performances where athletes brought home the hardware – winning first place medals. Three athletes were “triple threats” – each winning in three events which considering the number of teams competing in the invitational was quite the feat. Selene Weaver from Franklin Monroe was first in the pole vault, long jump and 200m dash. Austin Bruner from Tri-Village swept the sprint events taking first in the 100m, 200m, and 400m dashes. Finally, Tanner Delk from Arcanum swept the distance events, showing great endurance. He was first in the 800m, 1600m and 3200m runs. There were two “dual threat” winners – Trista Hollinger of Arcanum who placed first in discus and shotput. Ansonia’s Brock Shellhaas took first in the 110m hurdles and first in the pole vault – teammate Matthew Shook placed second. 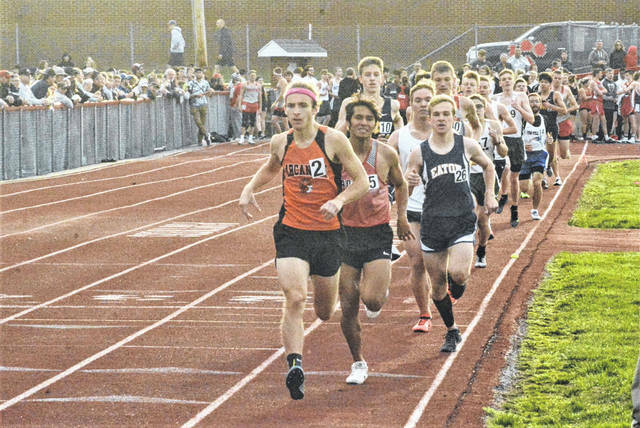 https://www.dailyadvocate.com/wp-content/uploads/sites/34/2019/04/web1_8-inch-Durkle.jpgRunners compete in the Durkle Track & Field meat at Twin Valley South.